The Eurasian hobby (Falco subbuteo Linnaeus, 1758) belongs to the order of the Falconiformes and to the family of the Falconidae and is one of the most beautiful falconets flying in our skies. It exhibits a unique, to say the least, elegance and unequalled lightness and maneuverability. A Peregrine falcon (Falco peregrinus) structure, to whom it resembles even if the dimensions are rather more reduced, united with a Harrier (Circus sp.) lightness due to the long and narrow wings and with a Pallid swift (Apus pallidus), agility, with whom it shares the shape and the speed. To above characteristics we have to add an elegant and coloured livery and an attractive and little fierce look. A very common hawk in Europe during the summer, typical of the open countryside, but that often shows up also in public parks with sudden and very fast swoops even if only for catching a dragonfly resting on the ground. The scientific name Falco gets its etymology from the Latin “falcis” coming, in its turn, from the Greek “phalkon”, referred to its sickle-shaped wings and the name of the species subbuteo comes from the Latin “sub” = under, similar and “buteo” = buzzard. Somewhat strange to associate with this definition the Eurasian hobby to a buzzard, but it’s difficult to undertand the intentions of our old classifiers. Various are the vulgar names given to this raptor. Eurasian hobby in English, Faucon hobereau in French, Alcotan europeo in Spanish, Baumfalke in German and Ogea in Portuguese. They have always tried to give an explanation to the nickname given by the British and the French, quite similar to each other, but maybe the etymology has much deeper roots. 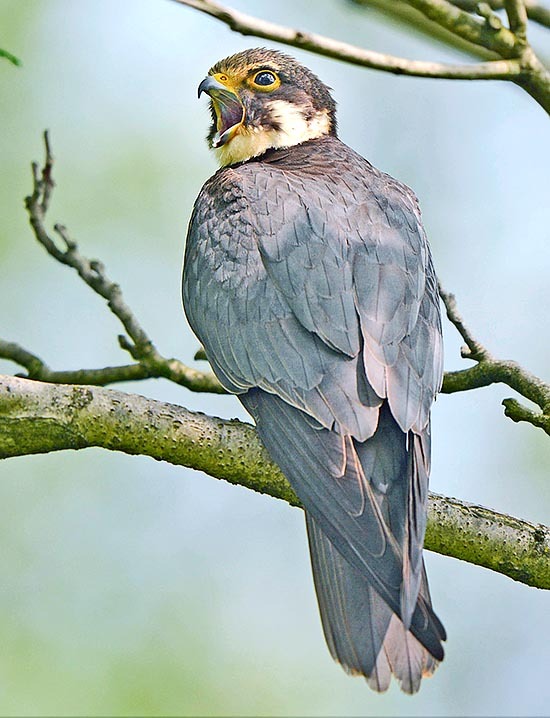 It appears that these two terms are both coming from the old French hobe or hobet = falcon, a conclusion rather trivial in itself, but that this should be coming, in turn, from the old Dutch hobbelen with a meaning having at last a concrete relation with this small raptor. As a matter of fact, this term means to rotate, to flip, to twist, which rightly is the description of the impulsive and impetuous flight of this bird. In Italy, the term “lodolaio” has been given to this falconet as it was thought that while flying fast over the fields it was running after the larks (“allodole” in Italian) that rose in flight upon its passage but actually these small birds are its preys only occasionally, as the hunting modalities and the victims of this raptor are quite different. 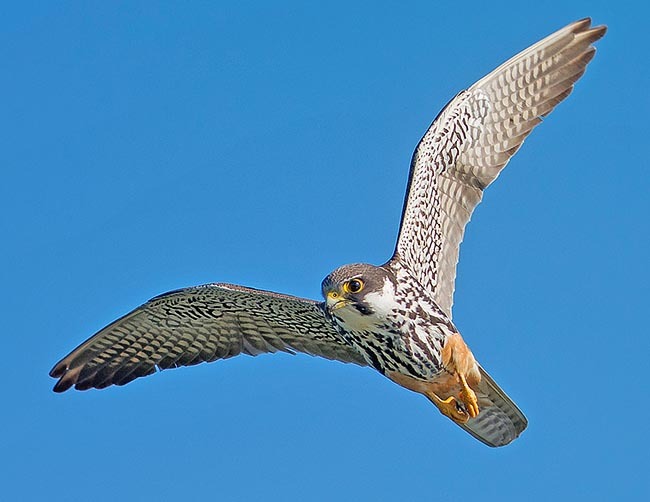 The Eurasian hobby, besides having an already innate fast flight, has, as they say, a higher gear. Once sighted the prey, it does rapid and sudden sprints, defying in terms of pure speed the prefixed preys that it chases till their capture. This would not appear too odd seen that various are the hawks hunting in this way but the Eurasian hobby does it with particular species and when it’s matter to chase and catch some swifts, swallows or house martins, the challenge is far more difficult. 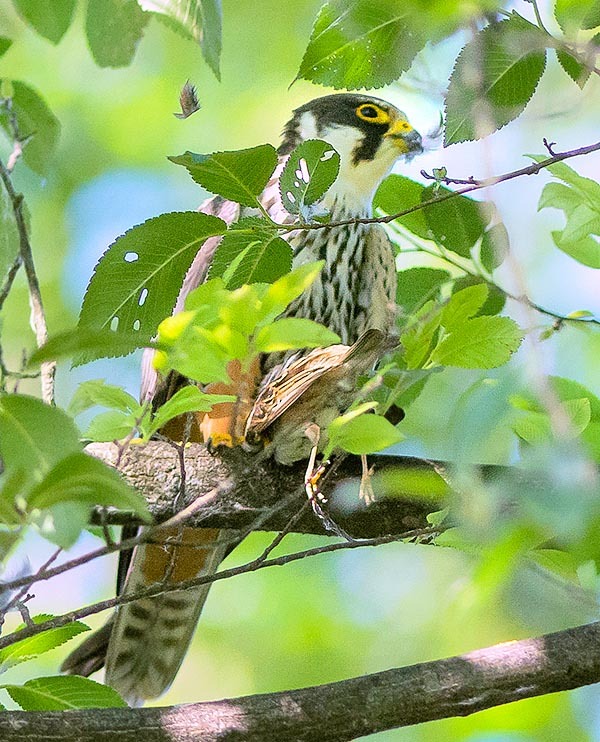 The Eurasian hobby never goes down to the ground, as, when the prey is caught, it takes it on a support well up on the ground or eats it directly while flying in small bites. The Eurasian hobby is a typical long range migratory raptor that spends the summer in the boreal hemisphere and the winter in the sub-Saharan or Indomalayan area, for the populations of the Asian continent. 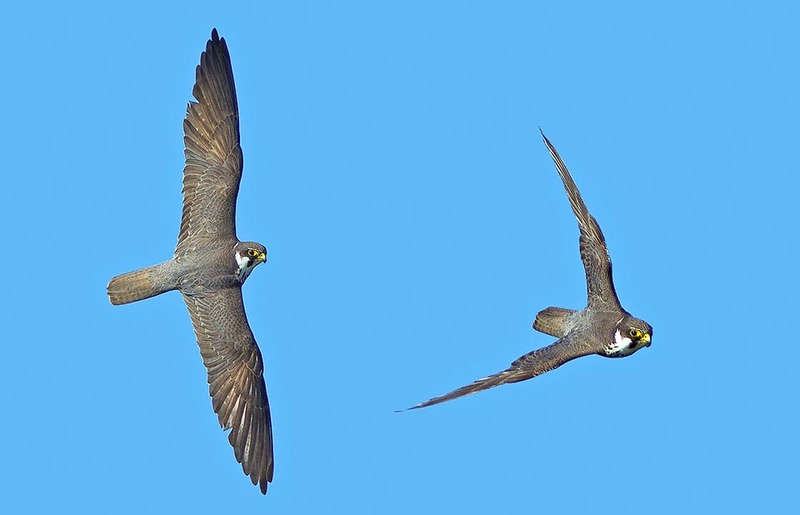 If we omit the tundra, the Norwegian coast, Iceland and the great Afro-Asian deserts, we can say that the Eurasian hobby occupies widely and entirely these two continents. It comes to us in May and goes back to the winter quarters already by September. It is never present in great number but its diffusion is vast and constant in all its range. In our places, it frequents areas with groves interspersed with vast plains but also swampy zones rich of marshes, due to its innate passion for hunting insects frequenting these sites. It does not love high altitudes unless during the migrating flight and preferably chooses plains, banks of large water streams and hilly valleys. It avoids thick woods and vast forests but in the European plains it does not disdain to frequent industrial poplar plantations and planted areas, where often nidifies. During the autumn migrations it loves to gather in small groups of several individuals, probably young of the same season and of the same small family, and to hunt together without any mutual disturbance. In this season they are much noisy and emit continuously their typical alarm cry that in this case is used mainly for maintaining the contacts with the members of the group. Usually, in the African territories they live isolated but they then gather quickly in numerous groups in the areas where appear abundant preys. Typical is their presence on the fire line during the seasonal savannah fires. Particular is the late August and September hunting to the dragonflies. The ability to catch them in flight during these passages along the ground is unimaginable and unforgettable. Swamps, marshes or simple irrigation ditches with stagnant waters, here is the ideal habitat for its hunting activity. Constant ups and downs with breakneck swoops and breathtaking wheelies for eating in altitude the prey, or better, the preys, seen that at times is able to seize even more than one in a single passage. During this period its spends hours every day in this activity and does not leave the hunting territory for long time till then it has not reached full satisfaction and full strength. Sometimes, on bodies of water rich of dragonflies, we can observe, for various days, small noisy flocks of Eurasian hobbies devouring thousands of these odonates. This is a typical pre-migratory attitude during which it assumes a significant amount of proteins in order to create that reserve of body fat that will allow to perform its very long migrations. A genetically acquired spacialization seen the facility with which is able to seize such a small and wriggling prey. During the nidification the type of feeding changes significantly and are carried to the nest only small birds, especially hirundinids or small bats, seen that it does not disdain to hunt also during dusk. The Eurasian hobby is a hawk with a very slender shape, with very long and quite tapered wings. It has a length of 35 cm, a wingspan of 70 cm and a weight reaching the 200 g. The tail is apparently short but this is only an ocular impression seen the remarkable length of the wings. The adults have a light bluish grey colouration on the rump and on the wing cover, white chest spotted with black drops that vaguely form vertical lines, trousers and undertail red brick and tail black barred on background slightly paler than the rump. Very white neck on which contrast two big very dark moustaches and wholly black head. The contrast of the white of the neck and the black of the head, with the two big moustaches, well visible also from far away, are particulars that facilitate the identification of this raptor. The eyes are black surrounded by a bare part of yellow colour, as well as the cere and the hooked beak.The legs are featherless, slender and slim, of straw yellow colour. The young have the chest of amber yellow colour highly spotted and rump of less compact light bluish colour and with slightly brown shades. They do not have the brick coloured trousers, characteristic they will get when two years old. When on the nest, it is of absolute discretion. It goes there unseen and stealthily and when hatching, realizing that some intruder is approaching, keeps flattened on the bottom uncovering only a part of the head up to the line of the eyes, in order to observe what is going on around. Hardly then flies off, suggesting that the nest is uninhabited. The partner then spends the day very far from the nest, also several kilometres, leaving the female alone and therefore not signalling with its presence, trace about the position of the nest. The female is an assidous brooder remaining hatching almost 24 hours per day and leaves the nest only for a rapid exit, by late afternoon, for feeding. So, nests that appeared abandoned, suddenly reveal inside them 4 or 5 heads of already grown chicks that appear with impunity. The Eurasian hobby nidifies on high trees taking advantage of those abandoned by the ravens, crows, squirrels or other raptors. At times they are nests badly placed or rather poor to which are added only small leaves for covering them inside but they seem so unsteady to lead to doubt of their resistance. As a matter of fact it is not rare to find at the foot of the tree where the nest is placed, some chicks accidentally fallen down due to sudden gusts of wind or unexpected failures of the structure. 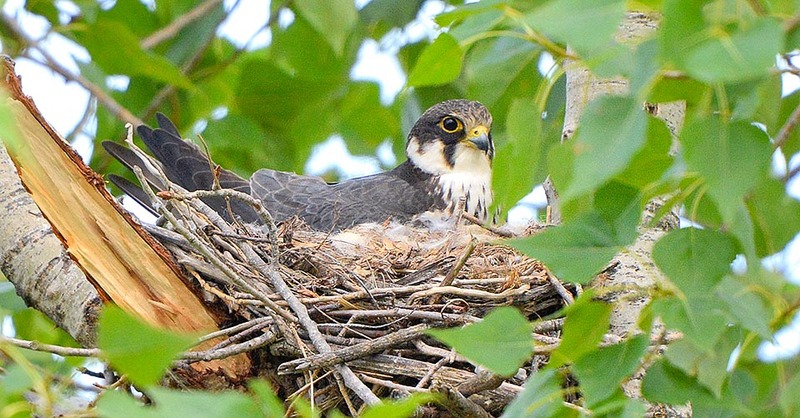 This raptor begins nesting after the middle of May and often the young are still in the nest by the first weeks of August. Actually, the Eurasian hobby, like the Eleonora’s falcon (Falco eleonorae) small raptor of the Mediterranean islands morphologically quite similar to our falconet, coincides the nidification with the beginning of the migratory fluxes of the passeriforms, an inexhaustible source of supply for the young still in the nest, in particular for the Eleonora’s falcon, or as travelling stock during the migration for our Erasian hobby. It lays 3 to 5 eggs highly spotted of ocher red, that are hatched for about 4 weeks and the chicks keep in the nest for 6 more, completing therefore the nidification season rightly in coincidence with the beginning of the autumn migration. 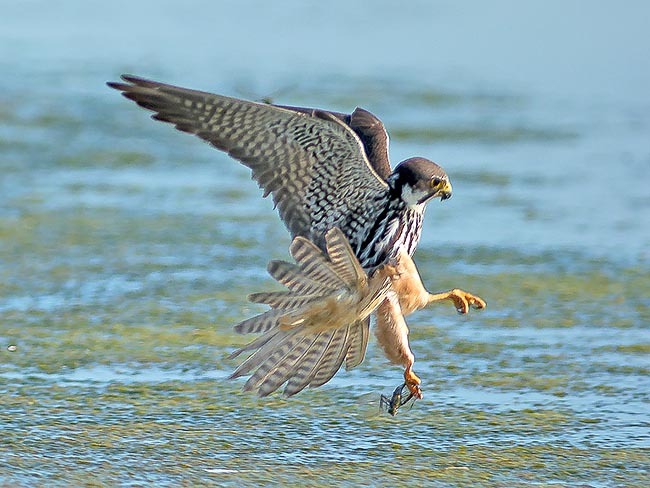 The Eurasian hobby can also be trained to falconry but only as a simple didactic specimen to demonstrate the innate and natural avian skills and surely not for its hunting capacity. It is not considered as an endangered species.